Authorities on Wednesday identified a 20-year-old Lemon Grove woman who died while hiking near Three Sisters Falls in Santa Ysabel near Julian. Nathalie Reed and a friend hiked the trail down to Three Sisters Falls on Tuesday morning, but in the afternoon, the friend noticed that Reed appeared to be dehydrated and hyperthermic, or overheated, according to the San Diego County Medical Examiner’s Office. Reed “stumbled and fell into the bushes along the trail, and a bystander called 911 from an emergency phone on the trail,” the Medical Examiner’s Office said. Sheriff’s officials received that call around 6 p.m. and immediately sent medical personnel and deputies in a San Diego Sheriff‘s helicopter to attempt to rescue Reed, sheriff’s Sgt. Chris Galve said. The helicopter airlifted Reed to the trailhead as paramedics performed CPR, but she was pronounced dead at 7:20 p.m. The Medical Examiner’s Office is investigating the cause of death. Reed, who was married, died the same day the sheriff’s department, Cal Fire and Cleveland National Forest officials released a joint video warning about the potential dangers of hiking at Three Sisters Falls and another popular water hike, Cedar Creek Falls, which are both made more appealing during hot weather. 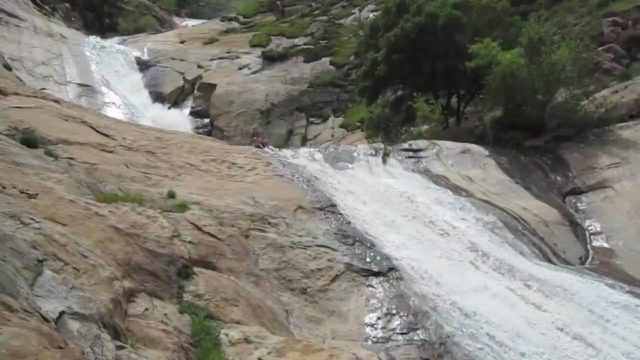 The 6.6-mile hike to Cedar Creek Falls in Ramona is considered moderate to strenuous, provides no shade and is completely uphill on the way out, Keim said. In 2016, rescuers responded to 51 calls of distressed hikers at Three Sisters Falls and Cedar Creek Falls.